It’s a thinly veiled secret on From Swamp to Summit that I’m from Orlando. That Central Florida city where one looks in vain for a hill to train on and ends up resorting to staircases. Staircases have been good to me. I’ve made it up Kilimanjaro, Mt. Elbrus, Illiniza Norte and Cotopaxi. And more to come. I hope. I may not have grown up here, but Orlando and Florida reach out to you with their sticky sweaty humid hands and hold you close to their hearts. I moved here in the middle of 1989. Sight unseen. True story. It was a snowy night in New York and husband J, who was finishing his Ph.D. at NYU received a tenure track offer at a small liberal arts college here. I’d never even been to Florida on spring break but after J interviewed in Orlando and described the smell of orange blossom, I was sold. So after a brief diversion through Greece and Turkey (another blog post in and of itself) we found ourselves, our one room of furniture, and our cat Chelsea in this city we’ve called home for over 25 years. A swamp does describe life in Orlando this week. But not the life giving jungle green of the Everglades wetlands. More the brown slough of despond. Exactly one week ago I awakened early, despite having been out in downtown Orlando the night before at a concert. And across my phone came word that at least 20 had been killed at the Pulse nightclub, not far from where we had been and a few blocks from my office. By mid morning the number had increased to 50. 49 victims and the gunman. This massacre was framed by the Friday night shooting of a singer from the Voice, followed by the suicide of the killer, and the tragedy a day after the Pulse shootings of the drowning of a two year old by an alligator at a theme park lagoon. The City Beautiful, as Orlando likes to call itself, didn’t look so beautiful anymore. On Monday evening I found myself at one of many vigils around the city at a makeshift memorial that has sprung up in front of the Performing Arts Center. There’s not enough public space in Orlando and what has happened there shows why people need to have a place to come together. There are candles, ribbons, photos, posters, notes written on paper chains. People standing are reverent. Nearly everyone I know has made a trip there. On Thursday, President Obama and Vice President Biden arrived. I watched the motorcade from my office window, together with some of my partners. I’ve seen many grown men cry in the last few days. That night, J and I went back to the memorial. A motorcycle club had its bikes lined up, illuminated in rainbow colors. They revved their engines, and a speaker for the club stepped forward and asked the several hundred assembled there to hold hands and observe a moment of silence. Everyone did. Rainbow flags are flying all over the city and practically every public building has been illuminated in the now familiar red, yellow, orange and blue colors. Tonight is a city wide commemoration that is supposed to be non religious, non political, and non branded. Just a time for people to be together. We’re going to walk down there. Perhaps after today, and the symbolism of one week later, healing will start. It’s a long way up any mountain. And it’s going to take Orlando a while to slog up this one. But I know that Orlando and its people have what it takes. What goes up must come down. And after our guide R put the kabosh on my secret plan to snail my way ever so slowly up the glacier to the top, timing be damned, the down is what faced us. We started off at a good clip. Ever since my way too long climb down Mt. Elbrus in 2014, I’ve focused on descents, with some modicum of success. R put me at the front of the rope on the way down the canalone – it’s certainly the safest place to be, but it’s also the spot where you get to pick out the route and match all the mixed up steps in front of you to create some semblance of a path down. I could tell I hadn’t acclimatized well because as I descended I felt more and more energetic – and we moved much better as a team than we had at any point on the way up. We finally made our way back to the scree field, and R went on ahead of us. J and I managed to pick our on way down, albeit with some wrong turns that increased the difficulty of the route. At one point we found ourselves on an 18 inch ledge with a sheer drop on one side. I’m sure that is not exactly the trail we were supposed to be taking. But at least the 18 inch ledge didn’t coincide with the increasingly high wind gusts. Two separate times I was literally knocked off my feet. There was a steady 30 plus mile an hour wind with gusts blowing harder. I didn’t slip – I was simply slapped down. Finally we made it back to the strange stone aqueduct that led to the hut. Apparently at one point there had been a grandiose plan to work with water and drainage on Orizaba, leading to the construction of a now defunct aqueduct feature that forms the first part of the trail up the mountain. And, how, you may wonder, were the other teams doing? Well, as mentioned, the Italian hadn’t even made it to the glacier before altitude overcame him. When we left the edge of the glacier, we could see three teams of two each inching their way up its stark white. They were no more than little black doodles on a white sheet of paper. It was hard to tell who was who, and it wasn’t until we were back at the hut and the two Russian teams showed back up without reaching the summit that we realized the top most team battling the high high winds was our own teammate G and our guide D! I wanted to wait to greet them when they returned, hopefully after a successful summit, but after we’d packed up and they still weren’t down, it was clear it was going to be a lot longer. We’d already been climbing for about 8 or 9 hours, and the green of the forest below was starting to seem inviting. And this is where the people part of the trip became bizarre enough to rival the uniqueness of our natural surroundings. We’d heard rumors that the Russian team included a high ranking politician and others – but how high ranking we didn’t realize until R arranged for us to hitch a ride down the mountain to the village in their two jeeps while he waited for G and D. There was one free spot in each van. J went with the politician and his fiancée; she hadn’t climbed but still looked pretty wind blown. When we say high ranking, we are talking cabinet level. I know; I figured out names and Googled everyone. Google images helped confirm I’d locate the right bios. 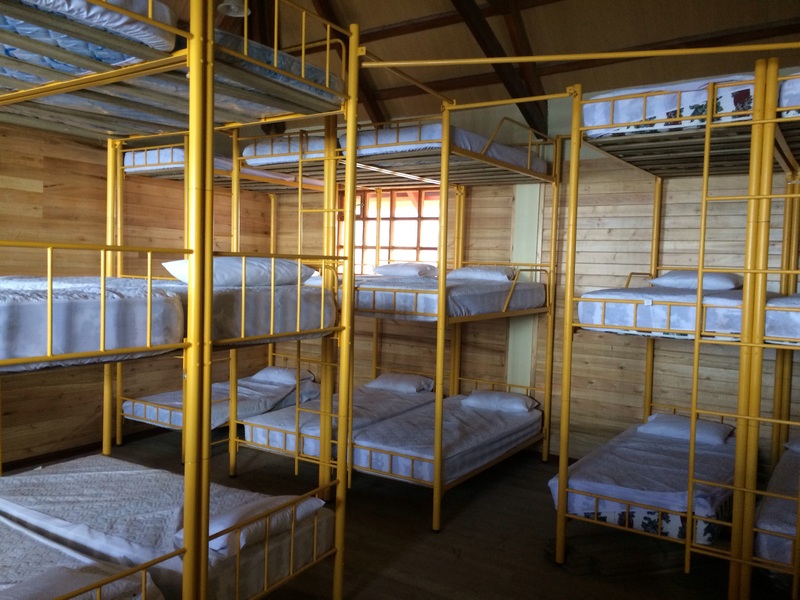 Who expects to spend a night sleeping in the freezing cold on wooden platforms in a hut in remotest Mexico with government officials from Russia. My jeep mates were equally illustrious in Russian political and academic ranks. Perhaps even more so for a would be mountaineer, as one of them had been a professional climber who had summited Everest in 1992 (where he and Scott Fisher of Mountain Madness fame had argued about placement of fixed ropes) and climbed K2 in 1996. He was also a snow leopard – meaning he had summited all of the highest peaks in Russia, no mean feat. (I found that last bit out through Google.) Anyway, we had a fascinating conversation on the way down, and it certainly added an international flair to the trip. Back at the hostel, we read and had a very late lunch. Eventually G and D showed up, with the glow of the summit still surrounding them and only a few bruises and battle scars to show. 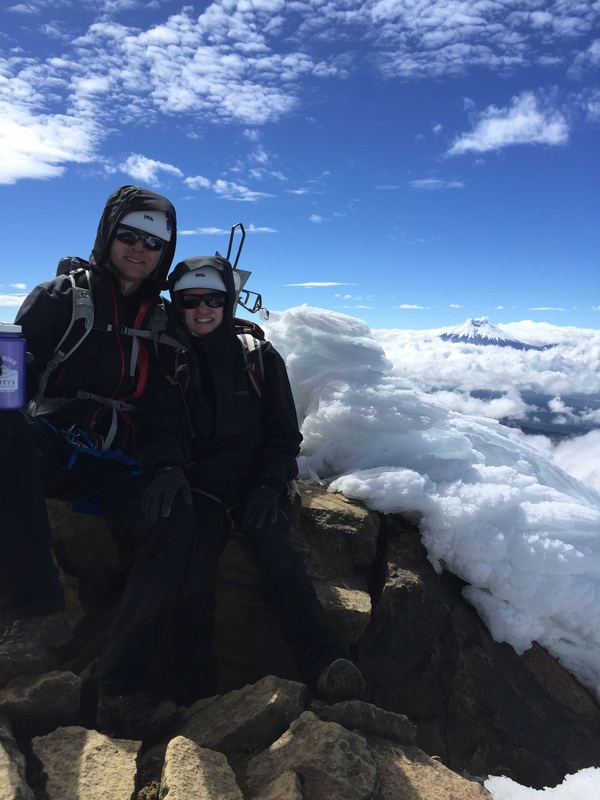 They had battled unbelievably high winds, and even though they couldn’t even stand upright on the summit, had the glory of being the only two climbers to make it to the the top that day. I just kept hoping a little of that karma would wear off on me. We had one more night in the hostel. A whirlwind of Mexico City comes next. Pico de Orizaba. 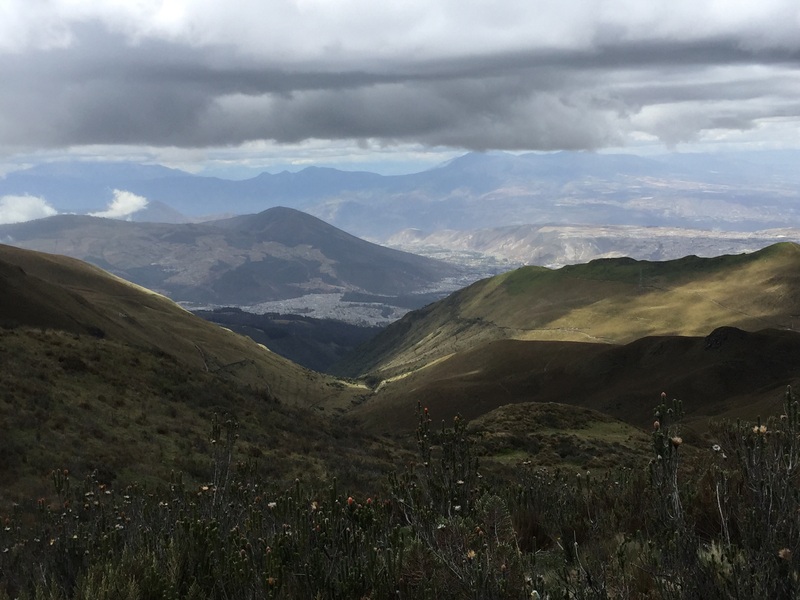 From the steep scree slope that starts the climb to the glacier to our multi-national companions in the Piedra Grande refuge – this trip had enough twists and turns for any best selling novel. After our day of rest at the Hacienda Santa Barbara, we packed up and drove a couple of hours through farmland and small villages into the heart of rural Mexico. 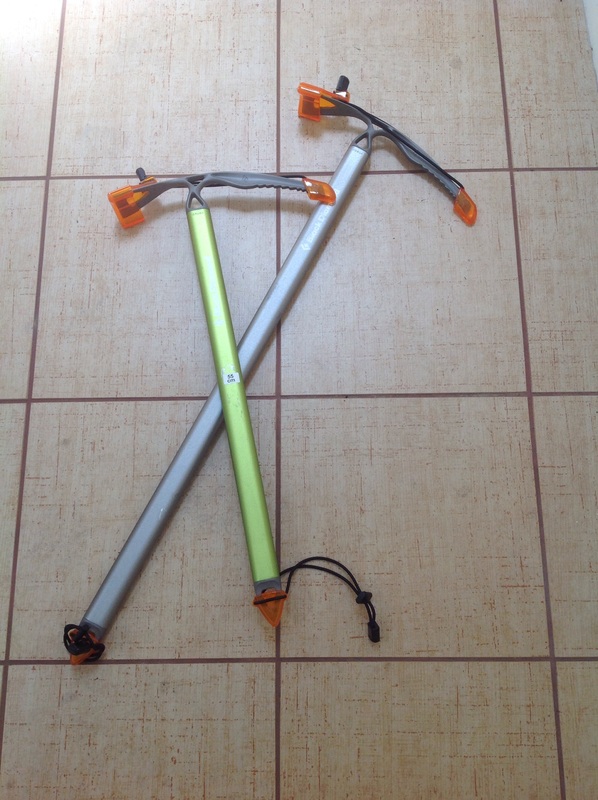 We were aiming for the Orizaba Mountain Guides hostel, located in, I believe, Tlachichuca. It’s a very small village. One gigantic house, protected by an elaborate gate and wall, dominates the streetscape. We understood it to be a vacation house owned by people from Mexico City. Corn was drying on the rooves of many of the village houses, which a couple of days later was being fed into a machine that stripped off the kernels. A lot of houses had large gates leading into courtyards not visible from the road. Again, I was struck by the interior nature of life here – little looks out on the street. Everything is directed toward the private family life behind the walls. G, our team mate, husband J and I had a room with two sets of bunk beds, perfectly adequate, but cold. My light weight down jacket was practically glued to my body by then. We all went out and took a look at the mountain when it appeared between clouds – and it looked steep! No two ways around it. Lunch was late – and filling. Pasta with a cheese sauce, followed by chicken breasts stuffed with ham and cheese. I decided we were just carbo loading. The afternoon was for rest and a few hours later it was time to eat again – this time steak. My mountain reading this trip was the Elena Ferrante Neapolitan novels quartet, and My Brilliant Friend was a good companion in the freezing room. Next morning we changed vehicles from the van to a beat up 4 wheel drive jeep that is de rigueur for the drive up to the mountain hut. Through an old growth forest to the tree line, continuing on a rutted road to the hut at about 14,000 feet. We were well aware that the wind forecast was very high. The hut contained three levels of simple wood platforms and two counters for cooking and meal preparation for whatever teams had shown up. The outhouses were rivalled those at Mt. Elbrus in the Cacausus Mountains in Russia. These had even fewer walls, but an equally commanding view. We commandeered a lower level platform as soon as we arrived, and immediately afterwards were sent up on an acclimatization hike to high camp. We’d had a lot of conversation beforehand about whether to spend the night at high camp – which would have meant starting off with heavy packs and trying to sleep in tents – or whether to have a day with more altitude gain – but sleep in the hut and be better rested for summit day. In light of the wind forecast, we opted for the acclimatization hike to high camp and sleeping in the hut. Our guide, R, decided to take everyone’s pulse ox (measures oxygen saturation) in the hut. Except for one time on Kilimanjaro at 16,000 feet, I’ve never had that done before. It’s not really clear what the measurements mean, and it can freak you out a bit. As it did me. G, our ironman companion, was well in the 90s; J was about 89; and I registered a whopping 84. Nope; not acclimatized. But after our acclimatization hike scrambling up the scree field to high camp for a couple of hours, I could tell I was breathing better and better the more elevation I gained. Sure enough, by the the time we descended and were eating dinner and ready for our paltry hours of sleep before summit attempt, I was back up to 90. I think even our guides were surprised. But the fact is, I think the extra days of altitude I’d had in in Ecuador really helped me Eachieve that Cotopaxi summit. Here are the players in the hut: our team: G, whom you’ve already met through this blog – Ironman triathlete and corporate executive, J, me, and our guides D and R. Next was an Italian climber, athletic, into snow boarding, with a Mexican guide. He read a paperback novel much of the afternoon before our summit attempt. A German woman with her American friend who walked from the hostel to the hut, arriving in late afternoon. We’d helped out by taking their wheeled suitcases from the hostel in our jeep and they were going for the summit the day after us. Possibly the first wheeled suitcases the hut had ever seen. I kept envisioning them pulling the suitcases up that rutted road. Then there was the group of Russians and their guides. More on them later. For you mountaineers out there – suffice it to say – Snow Leopard. We had whatever hours of sleep could be snatched between the howls of the wind and arose at 2 am. You sleep pretty much in what you’re going to climb in so base layers were already on. For some reason, R thought we should hold off on putting on our climbing harnesses until we needed them higher up – never again will I do that. I’ve always put my harness on before starting a climb and that’s a lot easier than fighting with it in the side of a mountain. It was unbelievably windy as we started, and the night stars glowed like sparklers. We headed up the same steep scree slope we’d just climbed that afternoon. But it felt even steeper and more exposed at night, and I also quickly realized that my resistance to putting new batteries in my headlamp (they were fine in Malinche? they are lithium?) was just dumb. It was definitely dimmer than everyone else’s and that makes a difference on a mountain, at night. It was clear from the start that we were at a different pace than G, and not long after we began he and D, one of our two guides, took off up the mountain. Finally, trudging away, we passed high camp, where we’d been just a few hours before, and kept going along a slightly less steep area to the canalone (spelling unknown), fighting wind every inch of the way. We knew in advance we weren’t going to attempt the Labyrinth, a steep outcropping of rock. It was too icy, and the canalone, a smooth flow of snow, was accessible. Only at that point did I start to feel that smooth movement where you are just putting one foot in front of the other and your breathing falls into rhythm. By then we’d roped up and were in crampons – and I had been way too over confident in my ability to don crampons without practice, relying only on my success in July with them. Some things you just need to do over and over. At some point the Italian climber and his guide headed down. Apparently he’d had altitude issues and didn’t make it to the top of the canalone. The smooth slope up of the canalone quickly changed and we were back to rock and ice and deep steep snow up toward the glacier. By then the winds were increasing even beyond what they had been, and it was pretty clear a summit attempt was not a realistic possibility. We were just too slow. I wasn’t properly acclimatized, and while small steps were manageable and I could get a rhythm, each time big step up required a real effort that then wiped me out for the next few steps. The wind was blowing; the sun glinting. But you know, I probably would have kept plowing away forever, at whatever snail’s pace I was going. And I think R, our guide, realized that, because when we finally reached the glacier at about 16,000 feet he simply announced that was all for the day. I think he thought otherwise I would just keep putting one foot in front of the other, however many hours it was going to take. The glacier was beautiful. A steep field of snow, the summit peering down. Way up on that steep white meadow we could see the others on the mountain who’d passed us. There was G and D, from our team, and two groups of the Russians. All in all, we had reached the glacier, the Italian team had returned, and there were six climbers left on the mountain. Next up – how we battled winds on the way down, hitching a ride to the village, and who got to the top of the mountain. 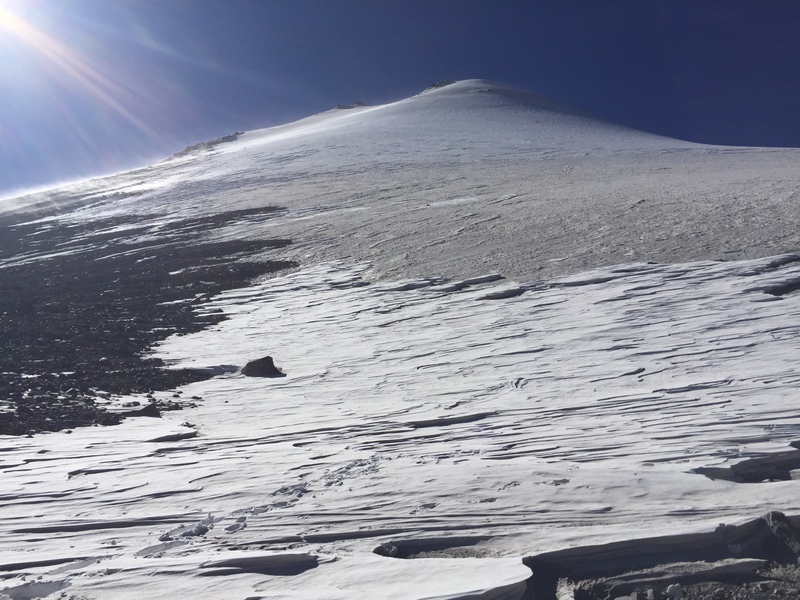 Over the last few months I’ve been publishing posts that refer to Pico de Orizaba, our next climbing destination, as though it’s a location at the forefront of everyone’s personal geography. That certainly can’t be the case – this particular mountain wasn’t close to the forefront of my mind until we started to try to find a big mountain that could be climbed in winter and in under seven days. When you live in Florida, the choices are limited. 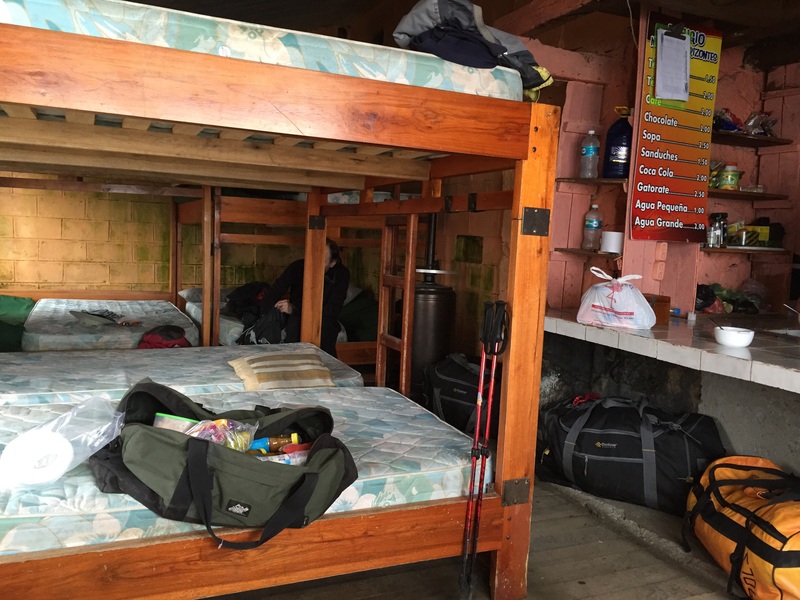 So after looking at our options, we settled on the Orizaba Express trip, again through Mountain Madness, the company that has successfully and safely led us up Mt. 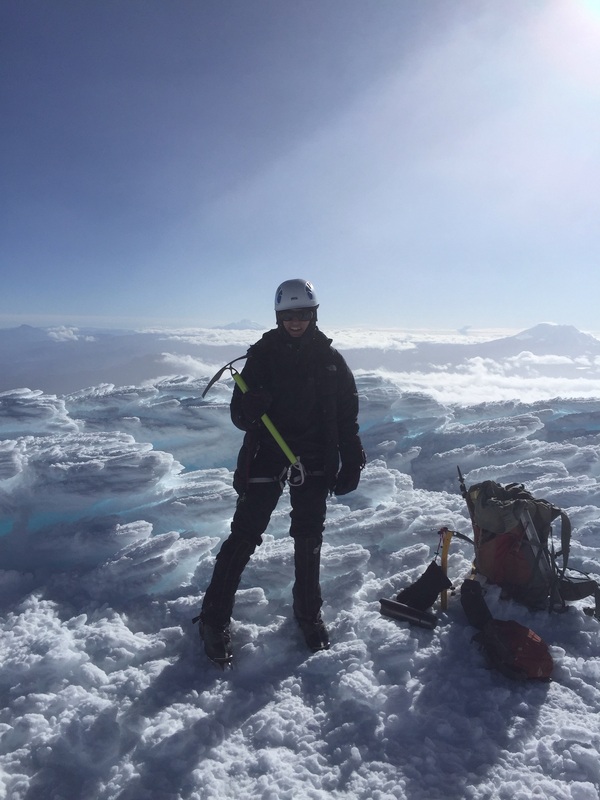 Elbrus in Russia and Cotopaxi, Illiniza Norte and Cayambe in Ecuador. During the colonial era, the mountain was known by the rather boring appellation, Cerro de San Andrés, due to the nearby settlement of San Andrés Chalchicomula at its base. It is the third highest mountain in North America (behind Denali and Mt. Logan), one of the volcanic Seven Summits, and the second most prominent volcano in the world, after Kilimanjaro. Pico de Orizaba measures 18,491 feet high, a statistic I find particularly notable because one of our teammates on Mt. Elbrus was part of the group that measured the mountain using GPS some years ago. After arriving on AeroMexico, according to our trip itinerary, we will start acclimatizing in Mexico City, around 7,341 feet. From there we journey to the pyramids of Teotihuacan, and the next day climb Malinche, 14,640 feet. 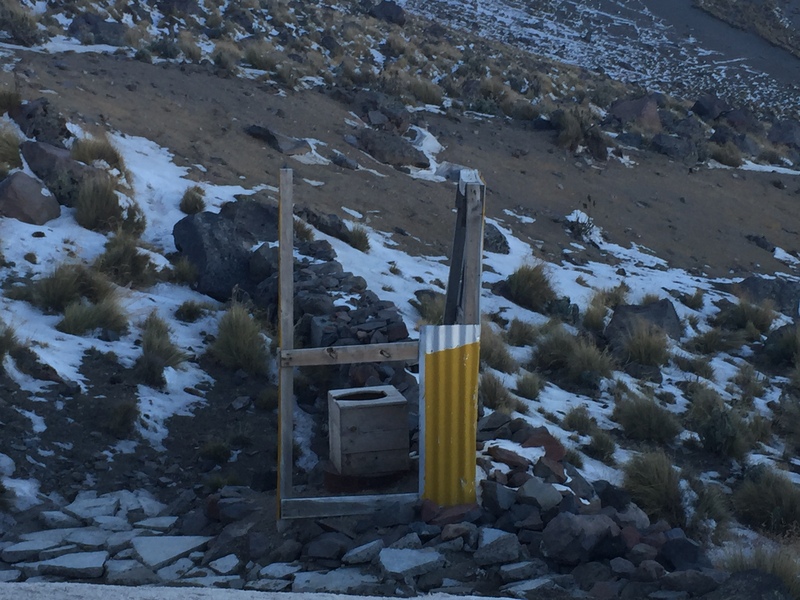 After that we travel to Tlachichuca, and – somewhat ominously – “transfer to four wheel drive” for the trip to the hut at Piedra Grande (13,972′). 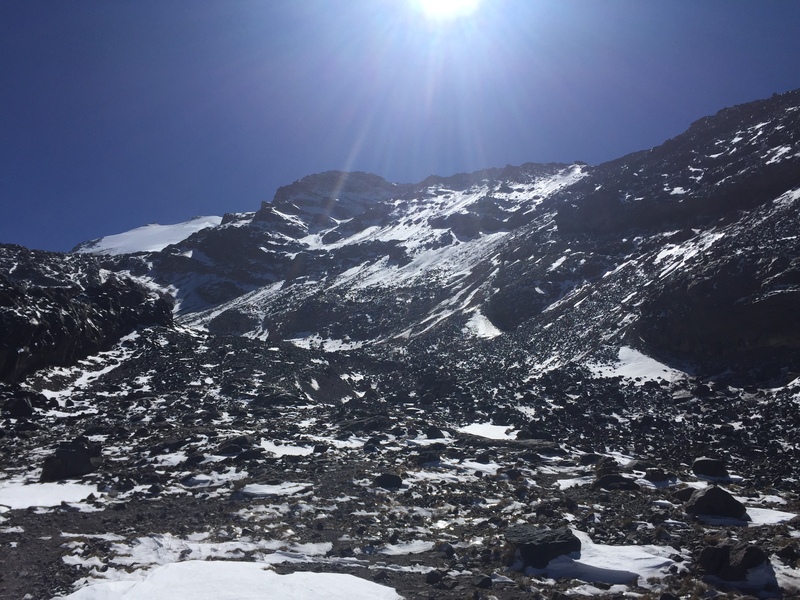 Our final acclimatization hike is to the toe of the Jamapa glacier at about 16,000′ and back down to the hut. Summit day involves elevation gain of about 4,500′ – which is a lot, and may be one of the biggest elevation gains we will have done in one day. To reach the summit, you traverse a rocky section named after one of my favorite words, the Labyrinth. The section right below the caldera looks really quite steep – definitely an area for ice axes. If it’s anything like Cotopaxi, I anticipate collapsing at the top – assuming the gods bless us with good weather and the mountain lets us summit. We’ll have a night in Tlachichuca and one final night in Mexico City – and then it will be back to Orlando on an airline I had never even heard of until yesterday, Volaris. I realized one of the reasons it’s so cheap is that you have to pay to select seats – but they let you have a free checked bag! I’ve been looking for free images of the Labyrinth, but couldn’t locate any. Perhaps a testament to the comparative obscurity of this mountain. But I love that it’s a mountain of many names. As I said above, and as many a mountain guide has told me – you don’t climb a mountain; it lets you climb it. And I hope that Pico de Orizaba will look favorably on us in just a few weeks. Four mountains, including one at 19,347 feet and another at 18,996 feet, in eight days, is a lot. I knew I was in trouble when I started to cough the night before we attempted Cayambe. And how did we end up at Cayambe in the first place, you ask? 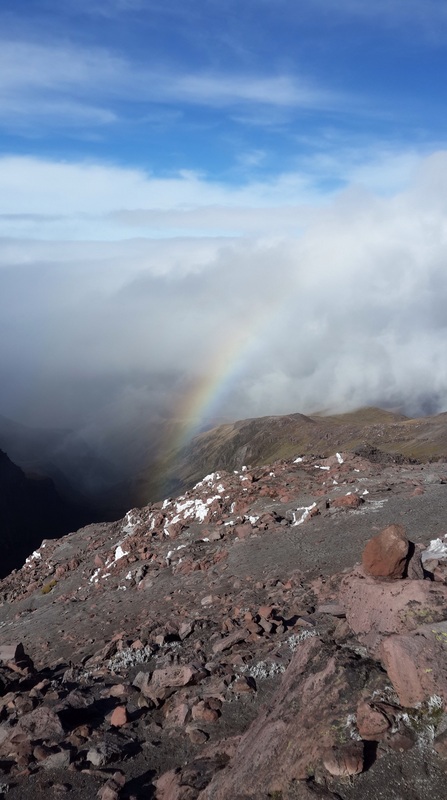 You’ll recall the original plan was to follow our Cotopaxi climb (second highest peak in Ecuador) with Chimborazo, the highest peak and the point on earth closest to the sun. 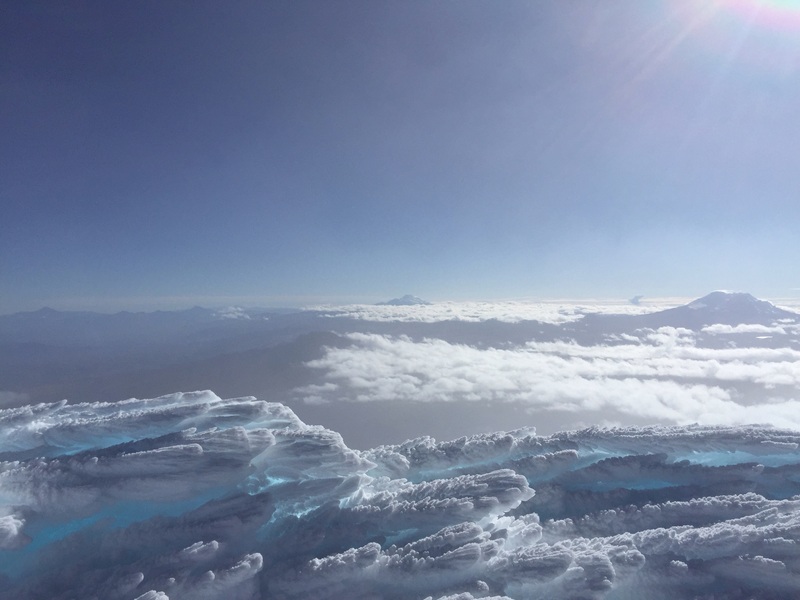 Well, the worldwide rise in temperatures is affecting Chimborazo as much as the next glacier. 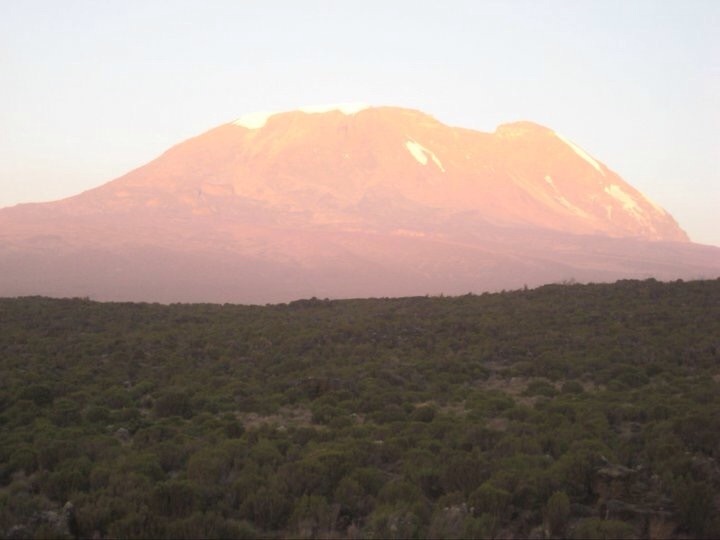 Have you seen photos of Kilimanjaro recently? Very different than 2011 when we were there. Warm glaciers create greater risk of avalanches and rock fall (not to mention the difficulties of slushy snow). Chimborazo is also a long drive from Quito and it’s one heckuva big mountain. So, prudence being the better part of valor we decided, with guidance from Ossy, not to let the wax on our wings melt by attempting to fly too close to the sun and instead to try Cayambe, Ecuador’s third highest peak at just under 19,000 feet, as the final mountain of our Ecuador trip. After our peak (literally) experience on Cotopaxi — even two weeks later I keep re-living it in my head — Cayambe was a logical choice. It’s just a little lower than Cotopaxi, perhaps steeper in spots (but for shorter sections), and has some rock to climb at the beginning. 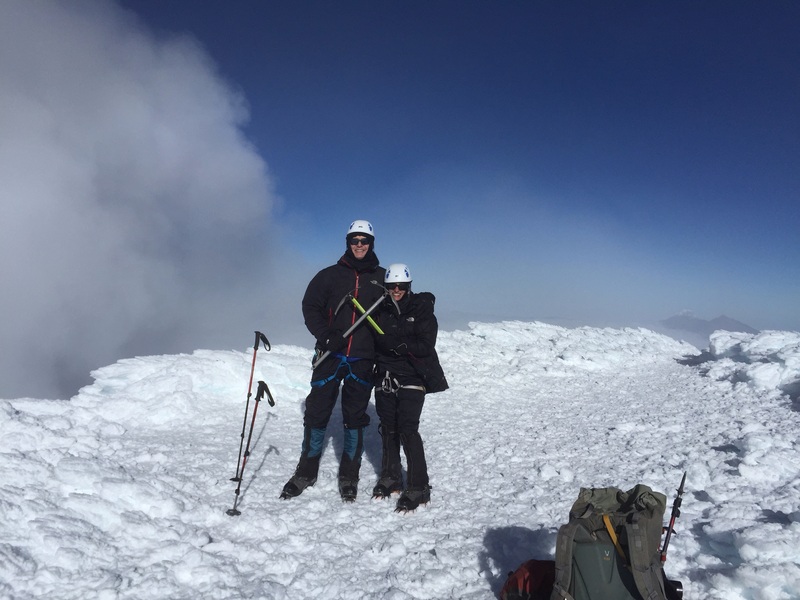 We had summited Cotopaxi at 9:05 am on July 3. 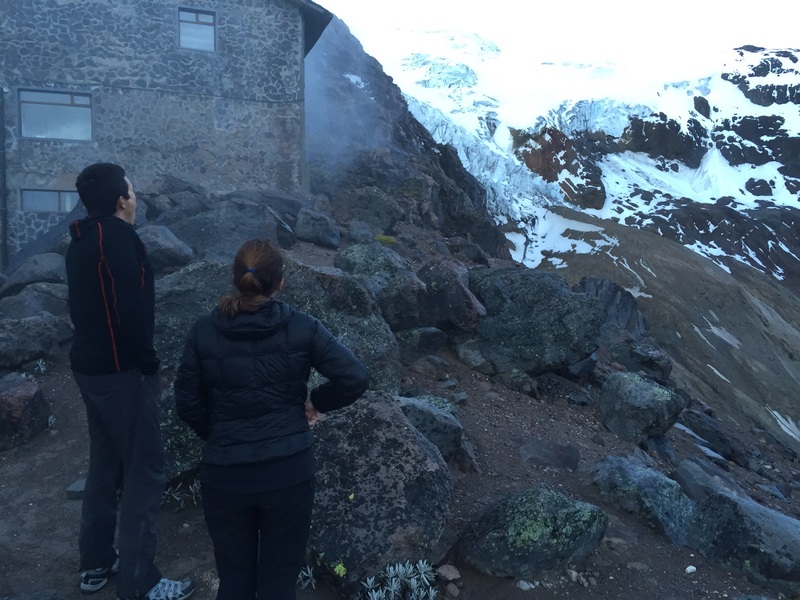 After a rest day in Quito on July 4, we left the next morning to drive to the hut at Cayambe. 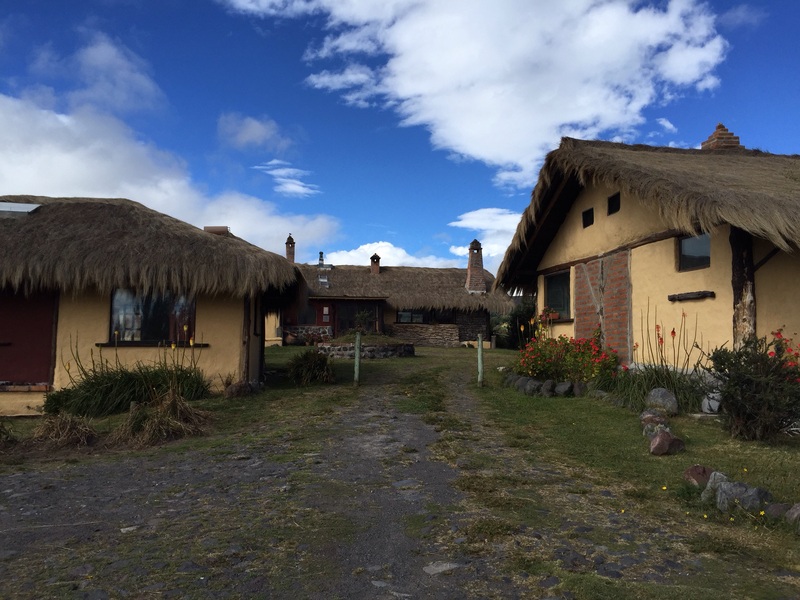 Unlike the other huts at which we stayed, at Cayambe you can “drive” – if that’s the right word – right to the door of the hut. 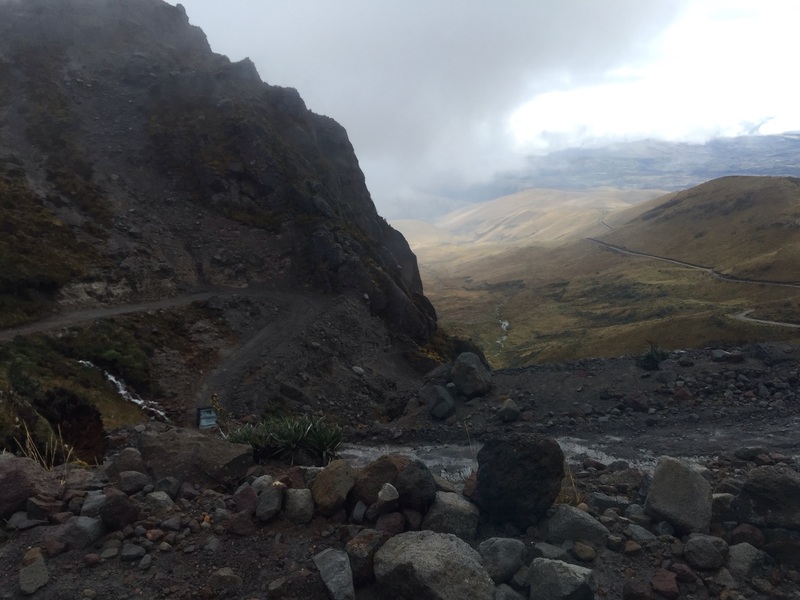 Road to Cayambe hut – and this was the good part! The road to Cayambe beats about any road I have ever travelled on for ruts, rocks, and steep precipices. It doesn’t resemble anything on which any self-respecting automobile should drive. We’d all learned our lesson by then about my issues with winding roads and cars, so I sat in the front. Ossy spent a lot of the time sticking his head out the side window to see exactly which snow, mud or ice covered rut would best create traction for the four wheel drive. Eventually we made our way to the hut and checked in. For the first time during our trip we were sharing the hut with another team, a large group of nine or so climbers with four guides. All males and considerably physically larger than I. As we settled in at a table in the main room we traded stories about what we’d been climbing – and I must say it was 100% satisfying to say “yes” when they asked if we’d summited Cotopaxi, which they hadn’t yet attempted, and to be met with some very bemused looks. For a five foot, one and one-half inch woman (that half inch is very important), I felt a certain instant credibility. As Ossy said though, the pressure on all those guys to summit Cotopaxi had just increased immeasurably! But Cayambe was the summit that was not to be. 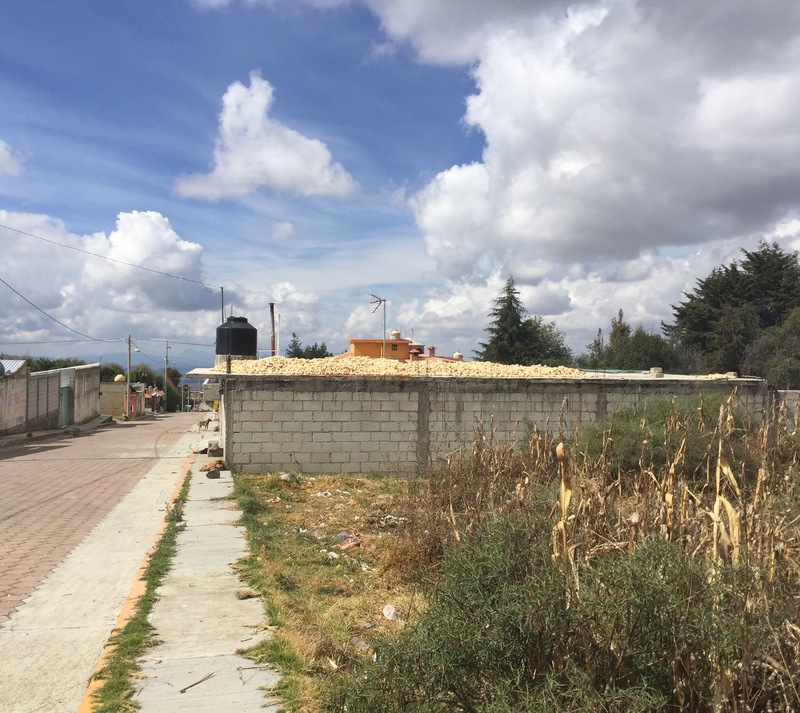 I still had not completely recovered from whatever stomach issues had so gravely affected me the night after we climbed Illiniza Norte and had also developed a nagging cough. Plus I think I was still generally burned out from Cotopaxi. 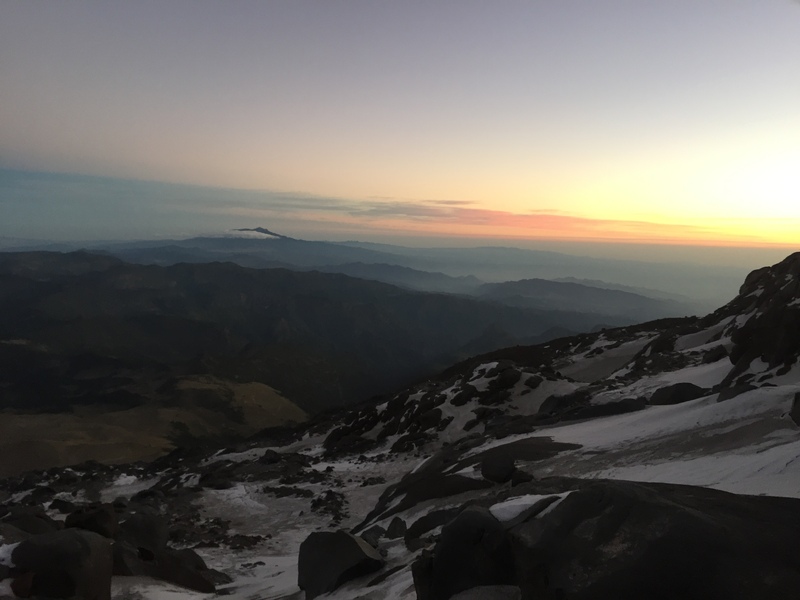 I had put my heart and soul into that climb, and I couldn’t help but regard Cayambe as a latecomer to the party. We followed a similar routine – packed for the next day, went out and looked at the route we’d be taking, ate soup and something sweet, and were in our bunkbeds by 6:30. I slept a couple of hours and we were up at 11:30 – this time with other climbers also packing up and getting ready to go. It did change the serenity of the moment. But, as the only woman, I got to have the entire women’s bathroom all to myself! The night was spectacular; the moon had waned only a bit and there was scarcely any wind. But the downside of all that was that it was quite warm – in fact, we all wore a layer less than we’d originally planned. And the snow was soft, meaning that once we were on the glacier we were sinking in and exerting a lot more energy than desired. Once we had scaled the rock area – which I had spent way too much time worrying about because it wasn’t that hard – we had to traverse through a scree and rock field and finally reached the glacier, where we could put our crampons on. But as we roped up and took off I just couldn’t attain the same sort of steady rhythm that I’d been able to manage on Cotopaxi. Although at one point we were among the highest teams I made the mistake of looking up and seeing how incredibly steep and seemingly never ending the slopes above me were, and let myself get distracted by what the other climbers on the mountain were doing. All of which added up to a point where I was feeling dizzy and our pace simply was not what it needed to be if we were to summit early enough to avoid the risk of avalanche as the mountain heated up during the day. Just then, one of the other teams that had passed us turned around after reaching a ridge line about 400 meters from the summit. We decided to go to the same point and then head back down. It turned out two other teams did make the summit but it took them 8 or so hours – an hour and a half longer than usual, due to the hard climbing conditions. Our descent went well, even though the scree field we were hoping to slide down instead of rock climb was covered with snow. That meant we had to turn around and walk back up an area we had just hiked down – possibly the most dispiriting moment of the whole climb. But I did well on the rock climbing on the way down, no ropes needed. And on the way down we were treated to a rainbow. Clearly a promise of future summits. Cayambe is still calling to me. I think we’ll be back. The wind shifted. I’ve always known the wind is important. After all, Mary Poppins arrived with the east wind, and there’s an old saying that if you make a face when the wind changes your face will get stuck that way. But I’d never really experienced just how important a shift in the wind could be until we were right at the lip of the Cotopaxi crater, just below the summit. After climbing Illiniza Norte, we spent the night at the Hacienda Chilcabamba. I went to bed at 6:30 and slept for about 12 hours – unable to face anything for dinner. I felt about a hundred times better the next day, and we had an easy morning at the hacienda, followed by a large lunch. J and I had a little thatched cottage all to ourselves, with two bedrooms and a sitting area, heated by a wood stove. We left in early afternoon to drive to the parking lot for the Cotopaxi hut. This time I sat in the front seat to avoid the gastrointestinal dangers associated with the curving cobbled stone roads. From the parking lot we strapped on our backpacks, which contained only what we needed at the hut and for our summit attempt. We were already wearing our base layers, to minimize having to change. 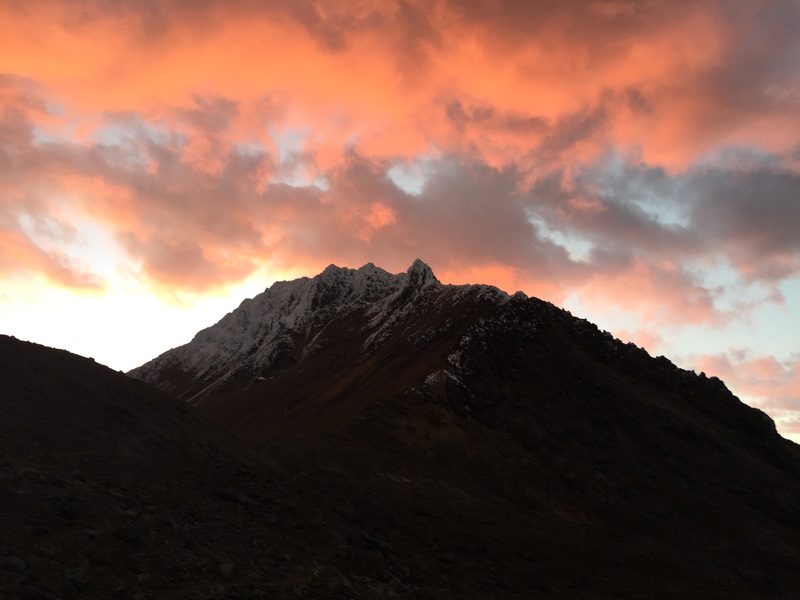 The walk up to the hut is about 45 minutes on a steep dirt road – we reached the top, only for Ossy to realize he’d left his phone in the car and had to go down to get it! The Cotopaxi hut was redone only a few months ago, and although nicely varnished and with new mattresses, it’s really cold and the roof makes an incredible array of noises in the whistling wind. While the Illiniza Norte roof clanged and sounded as though it might blow off, this roof variably screamed, whistled, hooted and howled. Despite all that, after we’d had bowls of quinoa soup, followed by figs, cheese and sweet biscuits, we still managed to sleep a few hours. We were supposed to awaken at 11:30 pm but slept through the alarm and ended up getting up at midnight. Just as on Illiniza Norte, we were the only people in the hut. And we soon found out there were only two other climbers on the entire mountain, besides us. We stuffed some food into ourselves and started climbing about 1 am. The first part is a 45 minute walk up a relatively steep scree field. Once at the top, you’re on the glacier, which meant it was time to rope up and put on crampons. The old “normal” route has been closed for 2 or 3 years after a climber was killed on it – too many crevasses. Instead you now use the Rompe Corazones – the heartbreaker. There’s an extremely long 2 plus hour stretch that simply goes up without any sort of break. And it’s a killer. I was trying hard to stay hydrated, so each hour when we stopped, the routine was water, a handful of trail mix, and more water. As we gained altitude, the trail mix became GU, and Ossy was literally tearing the top of the packages and holding them as I sucked the sticky sweet electrolytes out. We climbed up one sheer icy patch where we had to use the front points of our crampons – as if we were scaling a vertical wall. Much of the trek up was simple side by side steps, but even there I kept finding my crampons pointing too far uphill, and I quickly realized how much I had to learn in the way of technique. At one point you traverse a sea of Penitentes – formed by the wind, they are peculiar to the Andes in the summer months. Sometimes they are upright, but these were bent by the wind. They look like a field of praying hands, fingers outstretched in supplication. You can walk between or on them, and if on, each step sounds as though you are stepping on a brittle twig – or finger. The very last bit of Cotopaxi is steep, steep, steep. As we had to do in a couple of prior areas, we used the picks of our ice axes overhand to dig in and help pull ourselves up (normally you’re using your ice axe in your uphill hand like a very sharp ski pole or walking stick). But just before we reached that point, we saw the only other two climbers on the mountain turn around, apparently overwhelmed by the sulphur fumes spewing out of the crater. You may recall I mentioned that starting in May or so Cotopaxi had reactivated. It is “degassing” (lovely word) and literally tons of fumes are forming into thick heavy clouds over the crater – which is just below the summit. Despite the retreat of the other climbers, we kept on going. 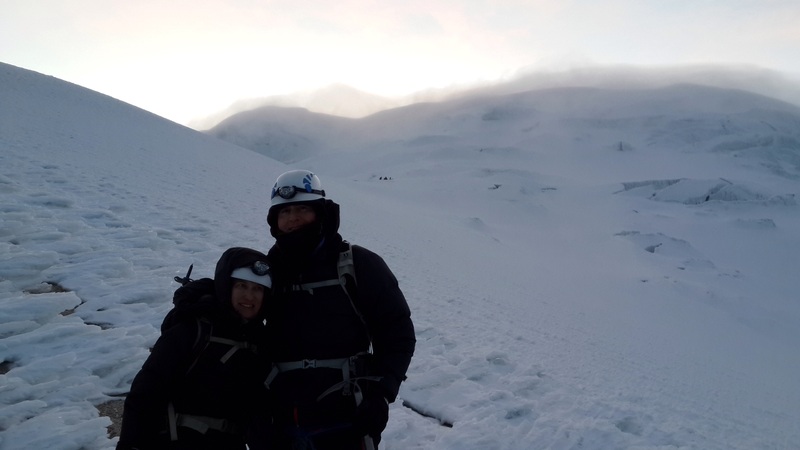 Although the mountain administered a pretty strong dose of sulphur to us – Ossy and J in their throats and me in my eyes – just at that point….the wind shifted. I heard Ossy say that we might have a window and I kept slogging up the close to vertical slope. Suddenly I was on a flat area – but surely I couldn’t be there. I was positive there must be another 15 or more minutes of sheer physical and mental pushing left and this was just a fake….but no, I was actually at the summit. There wasn’t anywhere else up to go. I’d seen people on YouTube videos throw themselves down on the ground when they finally arrived, and without even thinking, that’s just what I did too. We couldn’t stay on the summit for long – just in case the wind shifted again and the crater drenched us with another load of sulphur. Our descent was noneventful, which is about the best that can be said about descents. We kept up a pretty good pace, with J on the front of the rope, me in the middle, and Ossy bringing up the rear in order to arrest whoever might fall. It turned out we made it up in 6 hours and 50 minutes, well within the range of normal, and down in 3 hours – also what Ossy wanted us to do. Once back at the hut the reality of what we had just accomplished finally sank in. All those stairs; all those hot and sweaty runs. The culmination of all of it was that confluence of ice and snow and blue sky. A perfect summit. Some of you may remember that one reason we ended up in Ecuador instead of the Grand Teton was our conclusion that we preferred mountaineering to rock climbing. (See “Cotopaxi, Ecuador – 180 Degree Turns.”) So it was somewhat inexplicable that I nonetheless found myself on July 1 hanging on for dear life to an ice encrusted basalt wall with my left hand, ski pole in my right and nothing but an almost vertical drop of rocks below. Oh, and this was at about 16,000 feet. And did I mention no ropes? Illiniza Norte is one of the two Illiniza peaks (the other, obviously, is Sud), and is a common acclimatization hike in preparation for Cotopaxi. It reaches about 16,500 feet, and is the taller of the two forked peaks in the right in the photo. Its sister peak, on the left, is much more technical and is covered in snow. It was about a three hour hike to the mountain hut where we were to stay for our ascent of Illiniza Norte so we left in early morning. After fighting through Quito traffic, we followed modern highways for a while until we abruptly turned off to cobble stone roads, still in the same condition as in the 1940s when Ossy thought they were originally built. Jaw breaking and winding is an understatement. More on that later. We passed through several small villages, stopping at one to drop off things we wouldn’t need on the hike. Once we parked the car near the trailhead, we met up with the two men who took our supplies up to the hut on horses. Each day the horses plod up to the hut with full loads and bring trash back. Despite the routine, they seem quite content with their rather proletariat role in life. The mountain hut is primitive – but there are flushing toilets, even if you do have to go outside to get to them. There’s a series of about four bunk beds, going up to a triple level, a small eating area and a tiny kitchen. No electricity. We were the only people there, and, in fact, the only climbers on the mountain the next day. That night we were treated to a spectacular sunset with a full moon. The entire Avenue of Volcanoes was visible, including the white capped isosceles triangle of Cotopaxi. We got up at 5 for an early morning departure. The weather cleared as we hiked. There was more snow than normal, and many of the rocks were encrusted with icicles. I was glad of my climbing helmet since I hit my head several times on wide swathes of ice sticking out from the rocks I was trying to hold on to. There are several sections of rock, the most difficult probably the one right below the summit. We climbed up through a chimney, along exposed ledges – and all without ropes. Ossy very carefully instructed where to place hands and feet and how to balance – and ultimately we did make it to the summit which is marked by a metal cross. But that wasn’t before a bowling ball sized rock hurtled down from the top in J’s general direction, followed by a smaller one in his more specific direction. Fortunately, no injuries. We now know the best way to react to rockfall (besides not experiencing it in the first place!) is to make yourself as small as possible. Sort of an airline crash position. Coming down was exhausting and Ossy roped me in after I slipped twice. I think I’d burned up a lot of nervous energy on the ascent – not to mention physical. And we not only had to descend and get back to the hut – there was still the three hour hike back to the parking lot ahead of us, and then a couple of hours to drive to our next stop, the Hacienda Chilcabamba, outside Cotopaxi National Park. For someone who actually froze on the stairs of the Eiffel Tower and who still has recurring dreams about being stuck on the old swinging bridge on Grandfather Mountain in North Carolina, reaching this summit was huge. But it also reminded me that figuring out how to get down from summits is just as important as going up them. On June 29, 2015, at 8:15 am, J, I and our guide, Ossy, left the Hacienda Rumiloma on the outskirts of Quito for Rucu Pichincha. Reminiscent of Mt. Elbrus, you travel up the first section by way of gondola. The gondola was constructed in 2005 as part of an ambitious amusement park, restaurant and hotel complex that failed not long after it opened. The gondola is all that really survived and it’s a bit depressing to see the closed shop fronts below. Mountain hikes here start in the paramo – the Ecuadorian highlands. Wild flowers abound – white and yellow daisies that grow flat to the ground, violets, red bell shaped flowers, yellow blooms on bushy shrubs about waist high. 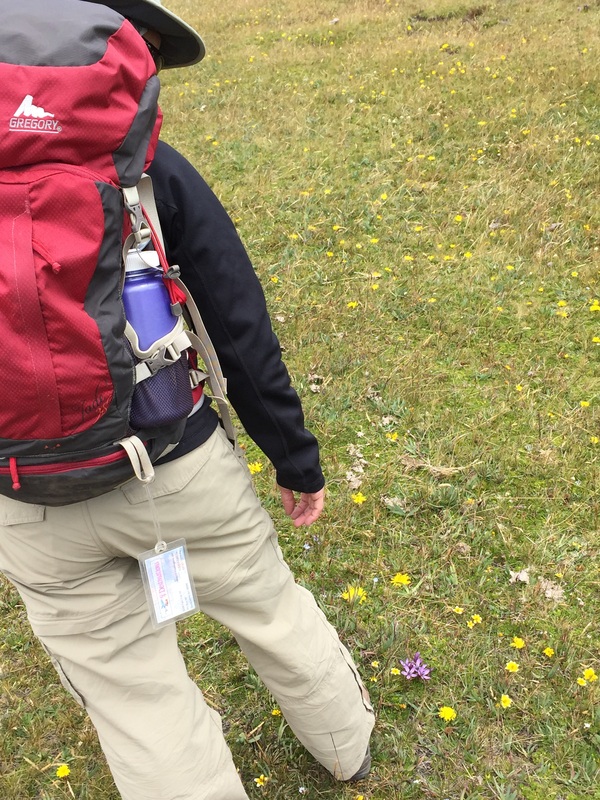 Parts of the hike were like walking on a carpet of flowers. As we neared the summit, there was some class 4 and 5 scrambling – using your hands as you scale the tumbled down rocks. The summit was spectacular. I never feel as totally in the present as on a summit. Going down was fun. We learned to down climb – facing the rocks, youbcontinuously look down for your next step, as though you’re on a ladder. It was surprisingly similar to the backward stair climbing I had practiced so diligently as part of my training. (I tried to do that part in flights I knew I was the least likely to encounter other people.) The rest of the trail down was runnable – that fantastic feeling of flying where you gather just enough momentum to take you up the next uphill bit. Of note, as we neared the parking lot we ran into the Climbing 4 My Donor group from the UK – a group of heart- lung transplant patients whose Twitter feed I had been following. So impressive. They had just climbed Rucu, were planning on Ilianza Norte and were substituting Cayambe for Cotopaxi due to the level of sulphur. 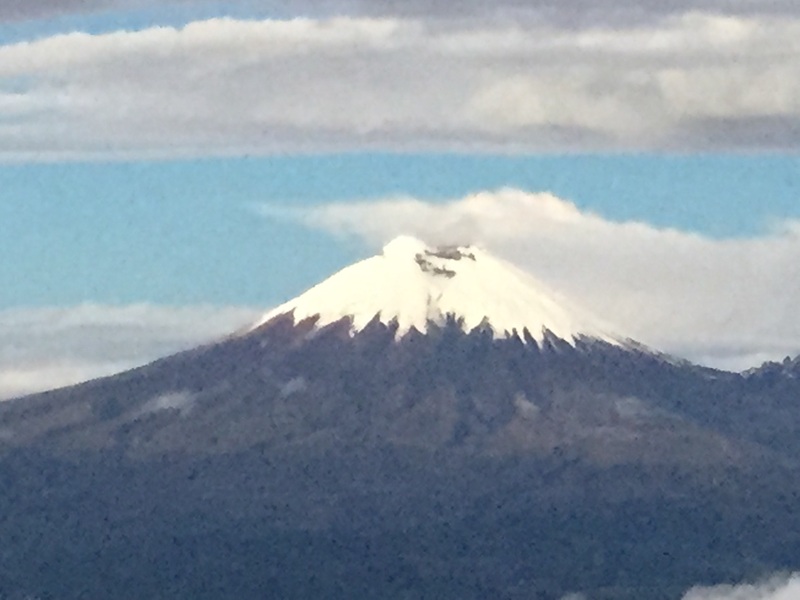 We spent another night at Rumiloma and then it was off to Illiniza Norte – our experiences in climbing up Class 5 rock without ropes, the rock that almost hit J and our first mountain hut to be posted shortly. As a preview – sunset from the hut at Illiniza Norte. Florida has treated us to some spectacular lightning strikes the last few days – cloud to earth vertical forks so brilliant I was actually blinded when driving on I-4 the other day. I’m hoping they aren’t a portent for our upcoming trip to Ecuador’s Avenue of Volcanoes. It is true that Cotopaxi, which is the highest active volcano in the world, has started to show signs of activity. While I have read that an eruption is not considered imminent, the mountain is degassing, letting off five times the normal amount of sulphur. So, we can add that to the obstacles we’ll have to contend with. 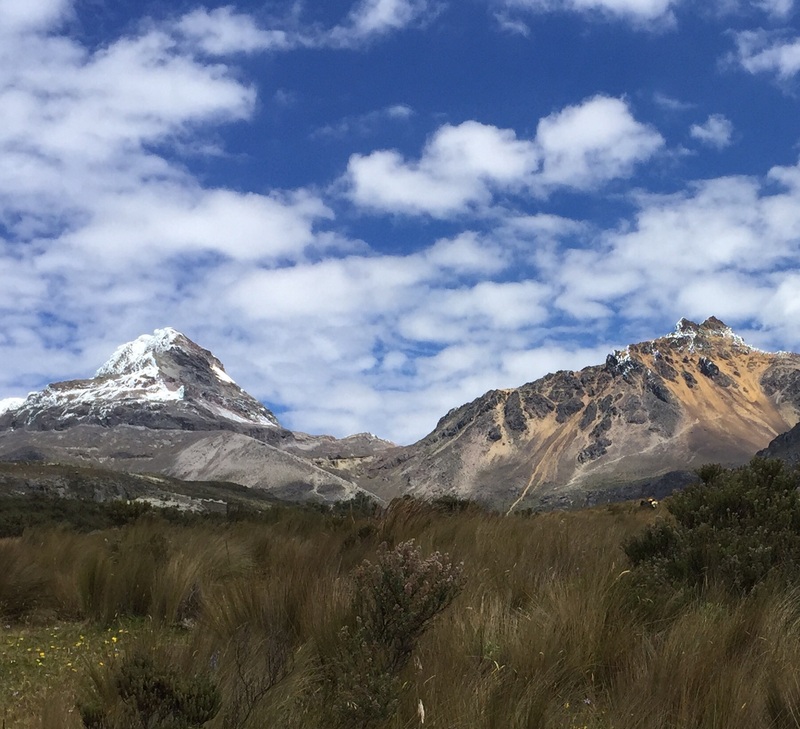 I suppose there’s a chance that the mountain could be dicey enough that it is closed to climbers – but there are plenty of other mountains in Ecuador – not to mention the highest peak, Chimborazo, which we are already scheduled to climb. And at least it is a dead volcano. So when I’m not scouring the Internet with search terms like “latest volcanic activity on Cotopaxi,” husband J and I are in the throes of last minute gear assembly and packing for Saturday’s departure on Copa Air. Our to do list includes items such as “cut 60 feet of rope into two 30 feet lengths,” buy GUs (for me) and those square gel energy things (for J), and “locate long underwear” (it’s amazing how things can get lost in a not particularly large house). I have also reached that blessed moment where I feel I can finally taper back on the training. I had my “PR” – to use a term of all you Crossfit people out there – on the stairs last week, 9 times up and down the building with a 25 pound pack. I may do more stairs but without the weight, as the pack is soon to be filled with climbing gear. And any really long runs are coming to an end just in time – because I’ve discovered that running in 90 degree heat and 90 percent humidity is no fun and certainly does nothing good for your splits (times for each mile). As these months of training draw to a close and the days of packing ensue – all I can hope is we’ve done what it will take. And equally important pray that the volcano and mountain gods will look kindly upon these poor mortals as they venture up. Today is Mother’s Day, at least here in the U.S. And since the theme of this blog is from swamp to summit, a brief shout out to all mothers may be appropriate. Of course, there’s my own personal experience of motherhood – both as mother to my two daughters and as a daughter and granddaughter myself. I was fortunate enough to know both my grandmothers – one from South Yorkshire in England, and the other from a small town in Alabama. Yes, I know it’s an unusual combination, but that’s a story for another day. Both of them worked, one as a career teacher and the other as a registrar at a college. They were both determined and fiercely independent women. I still wish I had seen them together when the Alabama grandmother and the Yorkshire grandmother went sight seeing together in London. I can only imagine. My own mother shares all those characteristics. She took up running in her late 40s, after discovering she had a natural talent for it, and ran for many years – including winning her age category in quite a few 5Ks. To this day she still walks a good two miles daily. I sometimes wonder if her sudden shift to become a runner helped inspire my decision to take up mountaineering and trekking at age 49. Being a mother certainly encompasses both swamps and summits. And since the younger daughter – known as S – graduates next weekend from Tulane University in New Orleans, I’m looking forward to experiencing a summit in the swamp. And just one more musing on the topic of mountains and mothers – the earth itself is described as Mother Earth, Gaia…maybe we’re all looking to return to the mother of all of us, to reach back to something primal and life giving, and that’s what leads us to the swamp, along the trail, up the mountain. 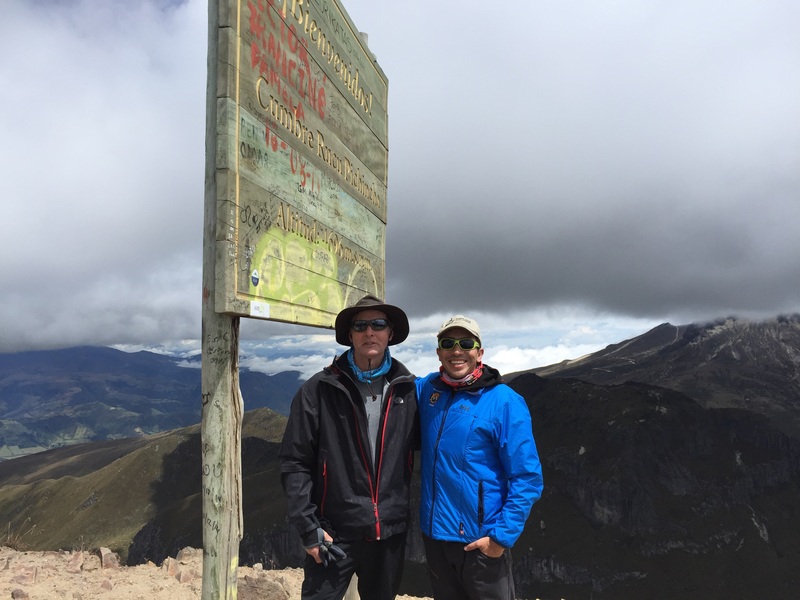 Countdown is seven weeks to Cotopaxi and Chimborazo.